Summer Checklist | Are You Ready For Deer Season? If you live and breathe the pursuit of hunting whitetails the summer is obviously not a time to relax! For those of us ate up enough with hunting, the understanding is that deer season is a 365 day a year event. Sure our fortunes as deer hunters are made mostly during November, but we spend the other days, weeks, and months daydreaming about and preparing for deer season. In fact so much thought and prepping is put into deer season that it would be astonishing to see the thoughts and the to-do list drawn out on paper. The thoughts, ideas, chores, and what-ifs in your head should now be organized and prioritized into a deer hunting checklist! Take notes and check off these to-do’s as you complete them. Whether you are just a couple months from deer season or just week if not days away from it, now is the time to ensure you are ready! Some may be a higher priority than others for you depending on your situation and property, but overall this summer deer hunting checklist should help organize what you need to be done! After looking through the checklist keep reading for more detailed explanations of why these items made the list! Summer is food plot season. Planting food for your deer not only provides extra protein for growth but forage to sustain your herd in the cold weather of the late fall and winter. Planting food plots takes several easy steps although it can be time-consuming. First, test the soil to find the pH or acidity level of the ground you wish to cultivate for your food plot. Finding the acidity will help you decide the next steps such as liming and seed choice. Lime is a base which helps bring balance to unbalanced soils. If your chosen area has had the nutrients washed away on a steep grade or is higher in elevation, then you will want to find the right amount of lime per acre needed to balance the pH to help optimize seed growth. Second, choosing the right seed for the pH is critical. Typically seed manufacturers will have the information on each seed and what pH the plant will grow in best. Taking into consideration what your goals are for a given location you will want to plant accordingly. Having a mix of high protein plants with high carbs and sugar –rich plants can help you create a year-round optimized buffet for your whitetails. In some cases, access to farm equipment is not possible. Through the power of science, seed manufacturers have been able to develop seed blends perfect for simply throwing on the untilled surface of the earth. Typically, these are perfect for food plots in the woods where small clearings make for perfect ambush locations. To create a food plot in the woods it is important to spray the weeds and rake away any debris like leaves, rocks, and sticks. Seeds must hit the open dirt. Carry a sturdy metal garden rake and have durable work gloves to protect from blisters. Cut the canopy of the trees back as much as possible to maximize sunlight. Lack of sunlight is what kills most food plot efforts. In the interest of time management, it is important to make trail cameras a part of your summer scouting checklist. Ensure each camera is in peak functioning form by checking each before hanging. Check the connections at the batteries for corrosion. Moisture can corrode metal coils and render a camera useless. The last thing you want is to set a camera up in a prime location and not capture any photos due to faulty or damaged wires. Always buy fresh batteries and use cleared and formatted SD cards to optimize performance when scouting for deer in the summer. Double check the straps on used to hold your camera to a tree are not dry rotted and risk dropping your expensive camera. When setting up a camera make sure it is facing North to ensure pictures will not be ruined by glare. Sun glare ruins photos at peak deer activity in the early mornings. Check to make sure all branches are out of the way of the camera that could trigger the motion sensor as a false alarm! Summer is a critical time for inventory, so make sure you are utilizing them as best as possible. Proven summer strategies for trail cameras include mineral sites, trail camera surveys, time-lapse over food sources, and transition areas between bedding areas and food. Protein and mineral supplements are a storied part of any spring and summer scouting season. In the heat of the summer, it is the best way to capture the photos to take inventory of the deer you really want to chase. Especially in areas where the soil is lacking nutrients, supplemental feeding and mineral sites in states where it is legal may be your best option to help push the growth of your herd during the growing months. Protein supplements are valuable and research tells us that finding a mix with 16-18% protein is optimal. Minerals are also important for bucks and does. During gestation and lactation does have high requirements for calcium and magnesium to supplement their growing fawns. A buck will utilize calcium and phosphorus by storing it in his body to use throughout antler growth. Growing bucks require tremendous amounts of minerals as they are growing their bodies and their headgear! Be sure to take out these bait sites well before deer season if required by law! As important as food is to the whitetail so too is cover. Mature whitetails, both bucks and does, require safety. Remember, deer are food and they know it all too well. Creating a safe place near food is a recipe for success. The best way to create your own safe place for deer is through the use of a chainsaw and hinge cutting trees. While cutting mature hardwoods is best under the eye of a trained forestry professional, there is plenty one can accomplish with a chainsaw properly cutting small to medium sized trees and scrub brush of little timber value to create a thick jungle of safety for deer. Cut properly, hinge cut trees will still produce browse for deer further increasing the value for deer. When cutting trees and brush it is important to use the following accessories. First, always wear eye protection. Wood chips and dirt flying everywhere from being cut can pose a serious threat to your eyes and face. A full face guard is advised. Second, always have a tool kit with the right equipment to deal with chains that may jump the track. A spare sharpened chain is a valuable asset as well. Getting your stands ready for the fall is a ritual of the season. Checking stands for safety is of utmost importance. Straps in particular that have exposed to weather for any amount of time in the fall and winter ought to be checked for weakness. A dry rotted strap can easily break putting you into a rather dangerous situation. Inspect the cables on all stands to look for any weaknesses and check the bolts for rust which can ultimately deteriorate the safety of a tree stand. Resist the urge to sit in your stand to scout during the summer. There is no sense if muddying up your area when you can scout fields from afar. A lot of hunters have lost the art of simply glassing for bachelor groups. The reliance on trail cameras for the majority of their scouting has left this tactic underappreciated. Glassing summer food sources and travel routes from several hundred yards away can be critical when developing an early season hunting strategy. While basic 10×42 binoculars are plenty efficient, having a spotting scope with real magnification power like 20-60x60mm puts you far enough away from the summer action to not risk spooking deer. REMEMBER: As always in the hot summer months and even towards the beginning of deer season it is important to always check for ticks! Illnesses from ticks are an epidemic and hunters are perhaps at the most risk. Always remember to spray down with deet or pre-wash your clothing in permethrin. Keep all clothing sealed off to prevent ticks from crawling onto you. A full body check after you exit the field is necessary and make sure to hang your clothes out after a hunt to let all the ticks crawl off. The dog days of summer are no time to relax for the committed deer hunter. This is when the homework happens to create success in the fall. While it is easy to become overwhelmed with all the work that needs to be done, setting a summer deer hunting checklist can help you organize your time efficiently and leave nothing to chance when the weather turns cold! https://www.gomuddy.com/wp-content/uploads/2017/06/summer-deer-hunting-checklist_feature.jpg 640 960 Muddy Outdoors https://www.gomuddy.com/wp-content/uploads/2017/10/Muddy_Logo_shadow-Low.png Muddy Outdoors2017-06-30 15:08:072018-05-07 19:12:48Summer Checklist | Are You Ready For Deer Season? If you’re anything like us, you eat, sleep, and dream about deer hunting throughout the year. If there is a winter storm coming through, we’re thinking about the rut. If we’re sweating through a summer heat wave, we’re thinking about how to get ready for opening day. If that describes your lifestyle too, you probably also enjoy watching deer throughout the year by using trail cams. There’s just something special about trail cameras and how you can stealthily keep track of the deer herd on your property without them having a clue. Sure, you could start glassing fields or summer food plots in the evenings, but that takes more time than most of us actually have. Plus, you might not have any fields near you; maybe you hunt deer in a big woods setting where you can’t easily watch wildlife. These are the situations where having a few hunting cameras hung in key spots on your property can make a big difference to your hunting strategies next fall. Here are a few trail camera strategies to get you started this summer. It’s not quite as simple as just throwing out a few trail cams in the woods and seeing what walks by. Sure, you could try that approach and you might get to see some wildlife eventually. But to get the most pictures, to get high-quality pictures, and to get information that will actually help you next fall, you need to focus on putting your trail camera in a spot that focuses deer traffic. Here are the best trail camera strategies for the summer. Food plots are great spots for getting pictures of deer for a few reasons. One, does and bucks alike need lots of calories in the spring to bounce back from the stress of winter. Throughout the summer, they need the food tonnage to build up their body weight and grow antlers to prepare for fall. This means high quality, protein rich forage! If you live in a forested area with very little agricultural food available, a single food plot is even more attractive to deer and your results will be better. Since it’s so critical for their survival, it’s probably the best place to hang trail cams on these locations. For larger agricultural fields (e.g., corn, soybeans, alfalfa, etc. ), the best location for game cameras might seem like the middle of the field where you can see the most deer. But since deer are creatures of the edge and will usually have set travel patterns throughout the summer, the best spot is generally along the field edge near a dominant trail. For smaller food plots (e.g., clover, cereal grains, brassicas, etc. ), you can place a trail cam on a post in the middle of the plot without any issues. But really it comes down to just finding a spot that concentrates the activity and facing the game camera in the right direction. One thing to keep in mind is that facing cameras any direction but north will inevitably produce some glare in pictures at some time of the day. Another reliable spot to capture deer pictures on your trail cams this summer is around their bedding area. After feeding throughout the night in destination fields or browsing in cutover areas, deer will shift to daytime bedding areas to chew their cud and rest. Often does and fawns will rest near or even within feeding areas, while bachelor groups of bucks will bed further away. Taking a quick scouting stroll from feeding areas and along main trails can lead you to bedding areas. They’re often easy to spot because of the oval depressions in the grass or weeds. If you’ve ever tackled a few habitat projects on your property, hinge cuts are great bedding areas to check out. If you’ve designated some bedding areas as deer sanctuaries that are strictly off-limits throughout the year, try installing trail cams along trails on the fringe of the sanctuary instead. Be cautious about checking them too much towards the end of the summer when you want to really hold deer in-place. The bugs will likely be bad enough to convince you to only go once or twice the whole summer anyway. More than likely, you’ll find some small bedding areas outside of these sanctuaries too that you can set and forget until the end of the summer. Of course, any main trails and travel corridors between the two areas above are also great spots to intercept deer movement. With a little desktop scouting, you can easily map these areas and find good potential corridors, but you likely have a few tree stands already hung in these areas anyway. Clear out the herbaceous vegetation in a spot along one of these trails so that you can get a clear trail camera picture. These small openings can also make deer pause long enough for a good picture. When it comes to positioning your trail cams along trails, the common instinct is to place them so that the camera is off to the side facing perpendicular to the trail. Unfortunately, unless deer are really slow-moving, your camera will likely trigger too late and you’ll only get pictures of their rear end – hardly useful from a hunting perspective. Instead, try positioning your camera facing up or down along the direction of deer travel. Granted, you’ll still get pictures of deer moving away from you half the time, but you’ll get pictures of deer facing the camera the other half of the time. Throughout the spring and summer, whitetails love to get an extra dose of minerals from the soil and plants around mineral stations. Lactating does need extra minerals to support their fawns, while Bucks need minerals to build their bony antlers. If you keep the station going for a couple years, you can easily train deer to keep coming back to it as a seasonal mineral source since fawns will be raised to use it. Eventually, the stations often become huge craters where deer have eaten the soil away. Luckily, you can easily set up a mineral site by scraping the debris away and exposing the soil in a given spot. Then you can incorporate some crushed mineral into the top inch of soil or simply place a block or rock on top of it. You can even place it on a semi-rotting stump, which will slowly absorb the minerals as well. But that’s about all it takes to set a station up. If you’re installing one of these sites expressly for pictures, it’s best to locate it in a shaded understory area. Pictures from trail cams along fields and exposed sites often suffer from lots of glare, which greatly reduces the quality of the photos. But pictures within shaded areas can turn out crisp and clear any time of the day since light doesn’t interfere. The final place that works great for trail cams are water sources, especially when paired with mineral sites. After eating something salty, we all crave a drink of water – deer are no different. Deer crave sodium due to the high amount of water they get in their metabolism during spring and summer. However, as the summer progresses and other waterholes or creeks go dry, a small water hole next to a mineral site will pull deer in. If you have natural wetlands, ponds, or streams on your property, you can easily locate mineral sites near them for the easiest solution. If you don’t have any water sources, you can easily sink a bucket, small rubber tank, or kid’s pool into the dirt to let it fill with rainwater. You can keep it cleaner by simply refilling it once you check cams. During hot summers or in southern, more arid areas, water sources can be the absolute best place for a trail camera setup, since it is such a draw for them. Once you’ve identified the spots and trail camera strategies you want to install this summer, it’s time to actually get them out. As already mentioned, pay attention to the direction you face your cameras, as south facing cameras will get lots of unusable pictures with a heavy glare. The one time you can get away with south facing trail cams is if you are in a forested or heavily shaded area. One of the best trail camera tips you’ll hear is to check the batteries and then recheck them to make sure they are fresh. You should also generally clear out some of the tall weeds, grasses, and even some brush in the area so you can avoid lots of false triggers. It’s a really deflating experience when you check your camera to find 1,000 pictures and 900 of them are of swaying grass. You can change the sensitivity level on many cameras to reduce this problem, but it still doesn’t hurt to make a small opening in front of the lens. Bring a simple folding saw with you when you enter the woods so you can easily cut any obstacles down. Depending on where you’re hanging trail cameras, you may want to leave a trail to get back to them. For new deer bedding areas in big woods spots, for example, consider putting out some trail markers or trail marking tacks to help you find them again. This isn’t a good idea on public land, obviously, as would-be thieves could follow your tacks/markers right to the camera. But it’s a nice option for private land. As far as when or how often to check your trail cams, it’s a tough call. The less you check them, the less invasive it is and more discrete your spying will be. After all, if you set it and forget about it for a few months, you can basically guarantee that you won’t interfere with the natural deer movement on your property. On the other hand, if your camera malfunctions after only a week of being outdoors, you could miss out on an entire summer’s worth of intelligence, which is just a terrible feeling (we’ve probably all had it happen at some point). Besides, we all feel the temptation to check them weekly. It’s kind of like Christmas morning when you get your chip and start to glance through them on the computer. If you have fresh batteries and haven’t had any issues with your camera before, let it sit in the woods for a month or two at a time, if you can bear it. If you’re not sure about your gear or if the opportunity is too great, then you’ve got two options. You can either charge right in making lots of noise (e.g., starting a chainsaw once in a while, driving an ATV, etc. ), which will push deer away well before you spook them at close range. Or you can stealthily sneak in with scent-eliminating clothing and rubber boots to be incognito. It’s up to you and how your property is managed. Good luck with your cameras this summer. With any luck, you’ll get some great pictures of deer to help guide your bow hunting on opening day this fall! Deer feeders create an interest for deer hunters, wildlife enthusiasts, and animal lovers alike. Whether it’s simply a wildlife feeder in the back yard, in the wood lot next door, or a vital piece of your deer management plan, chances are you will encounter the want/need to own a deer feeder at some point or another. Surprisingly, deer feeders come in a variety of sizes, designs, and uses. From the general wildlife feeder to a critical supplemental feeding program, deer feeders can certainly pull their weight no matter the use. Given such use, it’s respectable to put together a string of helpful information, tips, strategies, and uses. Welcome to deer feeders 101. Deer Feeder: A tool used to supply feed, usually in the form of grain (corn) or a specially blended deer/wildlife feed for nutrition, to deer or wildlife in supplemental feed programs. More often than not a deer feeder’s use occurs on the most basic level you can imagine. Simple and consistent corn feeding throughout the winter months appears to “help” deer and other wildlife through cold temperatures and heavy snowfall. In fact, feeding deer in the winter is a big concern for deer, deer managers, and many states. This is why it is included front and center in this article. Intervention in the form of a couple hundred pounds of “deer corn” can spell disaster for deer. This is why states all across the northern stretches of the country restrict or outlaw the use of bait and feeding of deer. Some of this concern undoubtedly stems from the possible negative outcomes of gathering large numbers of deer in one place…diseases being the concern. Have you heard of Chronic Wasting Disease (CWD)? That’s one of the big ones! However, another more likely concern that often goes unknown to the person supplying the feed is called acidosis. Acidosis occurs when ruminants (deer) consume large quantities of carbohydrates that are low in fiber, also known as corn toxicity. A deer’s diet during the winter consists of high fiber woody browse, not low fiber carbohydrates. With a sudden intake of grain, an increase and change in the microbial population in the rumen causes a fatal increase of lactic acid. Dehydration as a result of the buildup of lactic acid can be fatal in 24-72 hours. Photo: New Hampshire Fish and Game. Five of the twelve deer found dead due to winter feeding in N.H. However, concern over acidosis is waved throughout the Midwest and in areas where deer are already consuming corn. The corn maze of states in the Midwest such as Indiana, Illinois, and Iowa have so much corn readily available (either standing or left behind from the combine) during the winter months that the deer’s rumen and microbial population is adjusted for feeding. This also is true for properties and programs where supplemental feed is already taking place. The well-being of the wildlife and deer should always be taken into consideration first before your wants and needs of either supplementing nutrition or for simply observational purposes. For the more advanced deer managers and deer hunters, supplemental feeding always looms in the back of the mind. The number one reason for interest in supplemental feeding is always centered around the obsession of antlers…at least for the most part. It is widely known now that age, nutrition, and genetics (in that order) are the important factors that determine antlers and a buck’s score. Age and nutrition in particular are what we as deer managers can actively manage. Age is simply managing your trigger finger and the ability to age deer on the hoof accurately, leaving nutrition as a 365 day a year obsession. Habitat, food plots, and supplemental feeding are all management efforts we as deer managers can continually improve it seems. For the point of this article we will focus on supplemental feeding. The big question is “can a supplemental feeding program increase the size and score of the bucks on my property?”. The answer is yes it can. If you ask the question you can be sure a deer biologist or two have as well, and they have found the answers through research. “A study in Texas found that bucks fed a 16% crude protein diet grew antlers that scored 20 inches higher Boone and Crockett, than did bucks fed 8% crude protein (Hamel et al. 1989)” – MSU Deer Lab. 16% crude protein is the agreed upon percentage of protein intake that maximizes antler growth, however, it doesn’t tell the whole story. Often time feed containing 18-20% protein can help balance protein intake that is significantly lower in the other portions of the deer’s diet, when natural browse and protein levels of food plots/crops might dip below 16%. It also important to note that the protein requirements of deer depend on age. Mature adults do not need the higher protein requirements that fawns or young bucks need when developing. – MSU Deer Lab. Other than protein, minerals are also a thought pertaining to deer feed. In general, macro-minerals and micro-minerals are fulfilled by vegetation or eating the soil in natural licks. However, when it comes to deer management, it is always best to be safe. Identifying limiting factors of a property such as cover, water, or food is easy. When it comes to minerals a generally safe approach is ensuring the deer feed of choice contains the basics. These are mainly calcium and phosphorous. Knowing that a supplemental feeding program supplies benefits to the herd, and knowing what deer feed should consist of, the focus can now be turned to the feeder itself. A deer feeder offers several advantages over simply placing feed on the ground. Why? By knowing what goes into deer feeder designs, you discover their advantages. Access to feed and protection of feed are the most obvious advantages. The original thought towards a feeding program is usually brought on by a hard winter, or by the need to create an attraction for your trail camera/hunting site. The next thought is in the process you are currently in…research! You are trying to find out exactly what deer feed to use, if supplemental feeding programs work, or you are looking for deer feeder designs. That last one…deer feeder designs is because you are thinking of building your own. Why not, right? Seeing as how this is deer feeders 101, we have arrived at the same conclusion…sure, why not? Here is what makes a great deer feeder design…or a checklist if you will, to what a feeder needs in order to be successful. Waterproof – Nothing is worse than soggy, spoiled, and molded feed. Locking Lid – A locking lid gives you the satisfaction that the feed is not only waterproof but its safe from nuaisance animals. Durable – it has to survive rough weather and some of the biggest raccoons that appear more bear-like than a raccoon. Dispenser – A deer feeder needs a dispenser of some sort. This comes in the form of a port, a broadcaster (spinner), or a port/agitator. Large Quantities – Feeders with large quantities equate to less time filling. This is less time on your part but also less pressure associated with the feeder. Sure you can build one or go ahead and come the conclusion that buying a sturdy feeder will last longer and will inevitably be more successful. We offer a 200lb Gravity Feeder, and by design, it features everything it needs…simplified to be a very successful deer feeder. (Video) MGF200 Gravity Feeder is unlike any gravity deer feeder on the market. It features an adjustable spring-loaded dispenser and agitator. This feature keeps the feed broke up and dispensing while animals feed. The feed is lockable, and the lid is user friendly but cannot slide off like other feeders. If you are looking for a new gravity deer feeder, check out Muddy Outdoors. If applicable, and if legal, these tips can be taken into consideration to either spike the efficiency of the feeder or the scenario of hunting over the feeder. Either way, these feeding tips excel the situation beyond a feeder sitting in a field! The diagram below helps paint the scene for your imagination. Obviously, if you are in the research phase of either building or buying a deer feeder chances are you have a spot already picked out on your hunting property. What makes a “good spot” for a feeder? To start, high traffic areas are a must. However, you also have to factor in accessibility of a truck, ATV, or side-by-side that can reach the feeder. It is also important to think about what else should be paired with a feeder such as water, other food sources, security, proximity to bedding, and in states where it’s legal, your stand or blind. Another critical thought should be thrown in concerning human pressure. If the feeder is out in the open such as a large crop field or can be seen by someone driving on a road the anxiety of deer at the feeder will be high (not to mention potential poaching or theft problems). Keeping the feeder back in secluded, low anxiety areas can increase feeding and feeder success. Considering these factors can get a bit overwhelming so here is a list in order of how you should think about deer feeder placement. The diagram above is a common, or a slightly above average Midwest hunting property (the terrain and amount of timber is a blessing). As you can see, feeder site #1 utilizes all of the checklists and even goes above and beyond by integrating a bit of hunting strategy. Water, food sources, a plot screen, bedding areas, and access are all present allowing the site to be optimized for deer usage and traffic. You will also notice another feeder site…this is where hunting strategy really takes off. Even if your state does not allow hunting over bait you can still create the attraction and central hubs for deer socialization. These usually take the form of food plots and crop fields, but by adding other factors like water, feeders, scrapes, and minerals you can create an even more popular destination that imprints in the mind of the deer herd. This impression stays with a deer even well after the bait is removed. Hunting strategy in relation to deer feeders should focus on this aspect, again regardless of whether or not bait is legal to hunt over or not. From the diagram, you can see two feeder/bait sites. By creating two “social hotspots” pivoting on food sources you can create hunting opportunities for two scenarios. The wind dictates hunting…period. Bow hunters live and die by this simple observation and strategy. By installing and running two feeder sites, one for north winds and one for south winds, you create hunting opportunities regardless of the prevailing wind. This reiterates the fact that there is much to think about before a deer feeder is placed and filled! What is the ideal set up for a feeder site? Think about the obvious needs. With deer coming in continuously the feeder makes the ideal site for trail cameras. Beyond cameras, it also is an ideal site to create the idea of “social hotspots”. Mineral blocks and scrapes are also items that can add to the attraction and usage of the feeder sites. When it comes to trail camera usage check out the blog below on Trail Camera Tips. It gives insight into the setup, settings, and tips for each scenario such as a camera over feed. A couple more tips for feeding deer out of a feeder include two tips that can greatly help the success you achieve with a site. When filling/re-filling feeders, spread a bit of feed around the feeder…especially when you are introducing a feeder for the first time on a hunting property. Also be cautious of the scent, not for pressure but for nuisance animals. Take hand sanitizer or a field spray with you to spray your hands before going from the feeder to your trail camera. Feed scent on a trail camera could create enough interest for a raccoon to destroy the camera in search of more food! Is a supplemental feed program beneficial for your deer and hunting? Yes. Can a deer feeder integrate and enhance your hunting strategy? Yes. Should you use a deer feeder on your hunting property? It depends… If you have the need or want for more attraction, can keep up with the demands of running a feeder, and have checked your state’s regulations on feeding deer then the answer is yes! 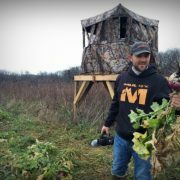 Keep an eye out for more content on deer feeders and hunting strategy on the Get Muddy Blog. Was this article on deer feeders 101 helpful? Leave a reply! Whether it’s a simple question or comment we would appreciate the feedback! The 9th inning has arrived and while to many hunters that sounds like we are the bearer of bad news, it, in fact, is quite the opposite. Knowledge is power, and in this case, it is your only opportunity at scoring a 9th inning buck. For the past several weeks our blog topics have been diving into preparation for the late season. It now seems to be a fit time to dive straight into the actual hunting tactics. For the last weeks of deer season, a ground blind stands as one of best tools a hunter can possibly use. The characteristics of the late season intertwined with a ground blind’s effectiveness is unrivaled during this time period. Take these ground blind hunting tips for the late season and apply them to your hunting strategy. The time period, the tool, these tips, and the strategy all come together to give you a chance at that 9th inning buck you are so desperately seeking. With state’s firearms seasons closing, bucks are finally starting to feel the effects of relentless hunting pressure lifting off of properties. This godsend goes hand in hand with the arrival of cold temperatures and the attraction of late season food sources. These ingredients spell out a recipe for one of the best times to kill you hit-list buck, even when it is the 9th inning! The reason for this is not just due in part to the biology and behavior of white-tailed deer, but what tools have been made available that are so extremely effective during these last weeks. In the past weeks, the relentless preparation and work to establish intel on late season food sources have been put entirely on the shoulders of trail cameras. In recent weeks we have provided countless trail camera tips, and trail camera settings for the late season in order to help you discover a “patternable” mature buck on these food sources. For all practical purposes, trail cameras have started and are currently telling the story of the late season. With the help of both trail cameras on time-lapse mode, and trail cameras in late season funnels a mature buck cannot go unseen when entering a late season food source. Now, with the season running out of pages so to speak, hunters look for a hunting tool and tactic to finish and close the book on a hit-list buck! During this time of year blinds, in general, take precedence over tree stands. Whether you favor box blinds, elevated ground blinds, mobile ground blinds, or bale blinds doesn’t matter, the simple fact is that they are the best tool for the job. Why? It’s Cold –Temperatures dropping beneath 32 degrees packs quite a punch, especially with a 10 mph wind backing it. Blinds offer a hunter a windscreen and ultimately provides a hunter with a buffer from the weather and late season elements. Deer are FED UP with Movement– By now deer are extremely wary of the slightest movements. This can make hunting from a tree stand nearly impossible. 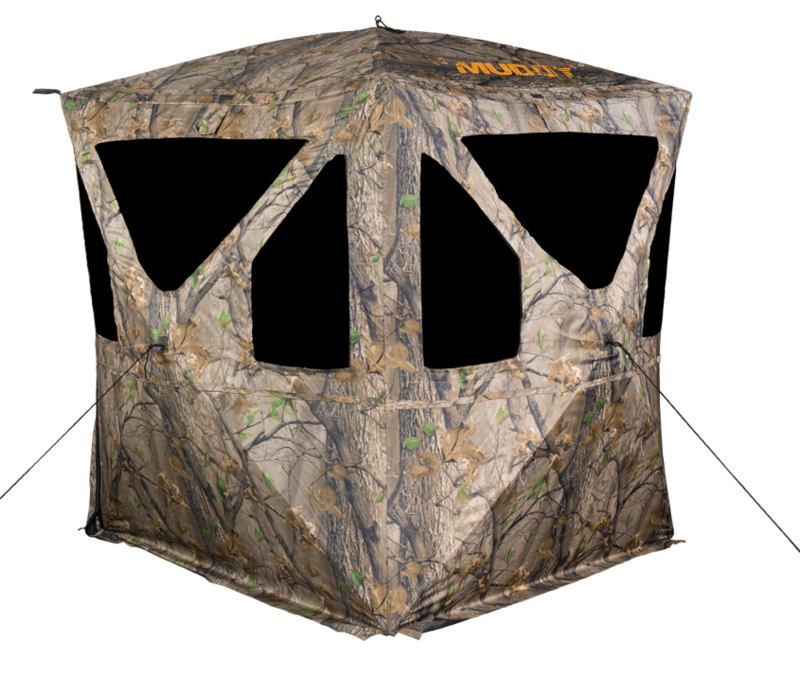 Rather, a ground blind or elevated box blind allows you to conceal your movements. Food Source– In this period of deer season, with the deer so heavily focused on food, easily mobile ground blinds can easily be placed and moved in and around the food sources according to patterns and wind directions. While blinds might be the best tool for the late season, no tool is without a flaw. The simple fact is that you are at the deer’s level. This requires extra precautions from both their sight and sense of smell. Ground blind hunting in the late season requires special attention in the placement according to both the deer and the food source. Trail Cameras Weekly’s Weston Schrank walk you through how to determine the perfect spot for the blind on your late season food source. It will depend entirely on these 5 features. Take a good look at these features not only when you are setting up the blind, but every time you hunt as they are constantly changing. Food Source – Identify and take a good look at the food source and all of the features and characteristics of the area. Bedding Area – Figure out where the closest bedding area is, also consider where a mature buck might bed. Funnels and Runs – You need to identify the main funnel or easiest travel route for the deer utilizing the food source. Wind and Thermals– The wind direction and more importantly thermals are the most important consideration in relation to your blind setup location, the bedding area, and where the deer will be. Hunter Access -Your entrance/exit route must be safe during the day and night, In order to keep the food source pressure free. By looking at a map and scouting the food source and surrounding area, the above 5 features will easily suggest the best location for the blind. Remember, late season hunting is nearly always afternoon hunting. It is ideal for the late season as deer work their way out of the bedding areas on very cold days to feed on the food source early to avoid the frigid temps of the early morning. This feeding will occur in daylight for the most part as they simply need more time to feed! This means thermals mid-hunt to the last hour of light will begin to drop off the hills and follow topography like water. The goal is to set the blind up where we can access it without walking across where we expect deer for scent purposes, or allow deer in the bedding area to see us, and also needing to consider our exit in relation to deer feeding in the field. At the same time, you must make sure the wind direction and/or the falling thermals are exiting the field in a way that for the most part deer will not catch your wind. By reading these ground blind hunting tips, you should walk away with three key take home points…One, the 9th inning is not the time to give up on deer season. Two, you should be hunting out of a ground blind during the late season. Finally three, there is a lot more to setting up a ground blind that simply placing it for the shot. With ideal blind setups for late season hunting, observations in place, and required prep work from trail cameras and scouting, you will be setting yourself up for success in either this week or the cold weeks to come! Now is the time for forgiveness! Your loved one has been most likely in the woods since October, but now that the main part of hunting season is over, they are finally back. What says forgiveness more than “I’m sorry”? How about a couple items under the tree inspired by his passion? If you are looking for Christmas gifts for hunters then you have come to the right place. We have some great deals on items for the hunter in your family! Nothing says Merry Christmas like a brand new tree stand or blind. Whether you like it or not, even though deer season is over your husband, wife, boyfriend, girlfriend, son, or whoever else you’re shopping for is already thinking about next year. A new tree stand or blind will excite them for next year, and fuel their passion during the offseason! Check out the deals below! Removable, Water-Resistant, Triple-Foam Padded Seat for All Day Comfort! For an even safe climb to your perfect hunting spot, the XLT Stagger Steps from Muddy are made extra wide for stability. Designed for use on crooked or leaning trees, XLT Stagger Steps give you an easy and fast climb. Powder-coated steel specialty texture adds no-slip grip. Durable orange nylon washers, spacers, and caps provide no metal-on-metal contact, producing no noise that could scare game. The XLT Stagger Steps are packable for easy carrying and storage. Comes with three Stagger Steps. Total height: 16′ (18” between sections). Section dimensions: 46″H x 14″W. Total weight: 21 lbs. Anyone of these Christmas gifts for hunters should put a smile on the face of your hunter in the family. If you enjoyed these deals and ideas, check out our blog on stocking stuffers for hunters! To go along with our Christmas gifts for hunters, we thought we would go ahead and supply you with some stocking stuffer ideas! Stocking stuffers for hunters are easy to buy, as the hunter in your family always could use more hunting accessories and gear! These 9 stocking stuffer items will fill their stocking full with quality items that the hunter will enjoy for many seasons! The hook is designed for use in multiple stand locations securely keeps your bow and other hunting gear within reach. Coated hooks won’t scratch or damage your bow or other gear, while the sharp metal tip screws easily into any tree for a secure hold. Each individual hook has a ten-pound weight rating. Looking for an all-around scent control product pack for this season. We are featuring a Xecute Starter Pack to cover everything from Shower to Field. A Unique System that Allows the User to Stay Attached to the Tree at all Times! These stocking stuffers will put a smile on the face of the hunter in your family, especially paired up with one of the many items under the tree from our Christmas gifts on sale right now! Any hunter would be ecstatic to unwrap any number of these items on Christmas day!